Before leaving for China last June to bring our 2 year-old daughter home, I was both excited and anxious, fearful and faithful. My life those last days before travel was consumed with the anxious thoughts of a frightened and desperate mother who was aching to get to her China baby but deeply dreading leaving her other six children an ocean’s distance behind. So when it became apparent that a precious part of my heart’s desire was not in my backyard but on the other side of the globe in a land both mysterious and unknown to me, I was more than a little uncomfortable. And I was torn. Every thing in me longed to get to my daughter across the sea but just as much of me was distressed at the thought of leaving her siblings so very far behind. During those last days before travelling to China my mind was primarily consumed with concern for my children on both sides of the sea. But a part of me deeply longed to be connected with another adopting family in China with whom we could share this adoption pilgrimage. Somehow, I instinctively knew that me husband and I would find comfort through companions in a foreign land and I longed to recognize a family in China with whom we could share this precious journey to our daughter. And I did recognize them. Quickly. We were in China only hours before I was aware of our pilgrimage partners. A family in our agency’s travel group was traveling with two of their older children. Their children were delightful and spending time with them was such a comfort to my husband and me as we were missing our older children so deeply. I remember knowing that their children would make good and fast friends with our flock back home. And this family had adopted a child before which was so encouraging to us a we stepped into the adoption arena and all of its emotions for the first time. They had navigated it only three years ago and were choosing to navigate it again. Nothing could have been as comforting or as encouraging to us in those last days and hours before our daughter was placed into our arms as witnessing a family who believed in what we were doing enough to do it again themselves while bringing their children to witness it! We received our daughters in China on the same day, at the same time, and in the same room… forging an intimacy that can perhaps be approached only by being present in the delivery room for a birth. We were witnesses to the raw emotions of those first few moments with our daughters. Over the next two weeks we witnessed the anxiety and grief in our baby girls and in each other. We listened to each other and encouraged each other and supported each other. In civil affairs offices and in police stations and in medical appointments, in the office of the U.S. Consulate General and ultimately on an endless airplane flight, we worried and rejoiced together. And, when necessary, we found much needed humor in the emotions and frustrations that surfaced as we learned to read and to comfort our children. At the end of our two weeks in China, I ached to see my state-side children but I grieved being separated from these friends and their support. I did not know how we would have been brave enough in China without them. As we returned to our homes and to our other children and began adjusting with our China babies, we continued to encourage and to check on each other. We supported each other and our babies through appointments with physicians and surgeries. We sent photographed images of our children as they bonded with their siblings and we joyfully awaited the day that we could meet again with all of our (11!) children. A few weeks ago, our precious China friends came through town on their way to visit family. The visit could not have been more of a gift. We had a beautiful early Autumn picnic and, as we watched our children play together, we witnessed how miraculously far our families have come since our precious time in China. I felt like there was hardly time to breathe! I had so much I longed to tell them and ask them and share with them while we had those precious moments face to face again! By the time they left and I reflected on our time together, I realized that this precious family was way more than our China friends. They were our forever friends who had been sent to us while we were in China…when we so desperately needed them. 10 years – in the life of a family – it can pass in a flash. But to one Dutch family –their lives have changed immeasurably over the last 10 years since they adopted a little Chinese girl when she was 16 months old . She had been abandoned in 2005 in Shenzhen. The Dutch family raised the child as their own with love and attention. During this time the Dutch mother began a search for the biological family of their beautiful little Chinese daughter. They really wished to bring her to her original home and even hoped that they could possibly reunite her with her birth parents one day. It was an optimistic dream that they pursued relentlessly. Miracles happen – with “Mother’s Bridge of love’s” assistance, on 10th August 2015, the Dutch mother and her Chinese daughter arrived in Shenzhen airport. The little girl was finally reunited with her biological family. MBL volunteer Maple, witnessed this very special and emotional reunion and then went on to assist the family during their 12 days in Shenzhen. “We have just returned from a wonderful and emotional visit to Shenzhen. After searching for almost 10 years we finally found my daughter’s family in April 2015 and visited them for 12 days in August. It was absolutely amazing to experience the immediate connection between my daughter and her siblings. Because of MBL, especially Maple, we were enabled to communicate with everyone and get around in Shenzhen. Our heartfelt thanks to the whole team of MBL! On 10th August Maple met and picked them up at Shenzhen airport, where the little girls biological family then welcomed them. From the second that Maple introduced the little adopted girl to her biological mother and sister – there was a very emotional reaction. The following 12 days in Shenzhen were filled with priceless, happy memories for the Dutch mother to share with her adopted child and her biological family. The search was over and there was time to create happy times for both families to share for the future. A few days ago, a 23-year-old girl, Joy (Chinese name is Jiang Peipei), from United States came to Nanjing with her American adoptive mother (Patracia) looking for her birth parents. Peipei was found in Nanjing when she was only 14 days after birth. After spending several years in an orphanage with Nanny Fan who took Peipei as her daughter, Peipei was adopted by her American mother Patricia and moved to the Michigan, U.S. This summer, with Patricia’s great encouragement, they took a long journey to China hoping finding Peipei’s birth parents. Peipei told us that she did not dream about finding her birth parents because the only clue she had was the place she was abandoned which is in Nanjing, Dachang District. But with the help of local police, MBL volunteers and a lot of kind people, they managed to find Peipei’s hospital birth records and some other important information. Life is full of surprises. Peipei’s dream was finally consummated and she found her birth parents within 24 hours. All the people were tearing when they met again after being separated for 23 years. Jiang Peipei said she was very happy to find her Chinese birth parents and she would like to come back to China more often in the future because here is the root. While we are excited about the perfect ending of Peipei’s journey searching for birth parents, we are deeply moved by the determination and love in her heart. It is this love that gives her the power to overcome all the difficulties on the way back to China, to her beloved family. It is this power that encourages MBL volunteers to help her and all the other children. The truth is we can not choose which family we were born or what we look like, but we have the right to live with our own wills. What Peipei did shows us the true beauty of forgiveness and kind. There are much more children in China, who were born in poverty but urgently look forward to knowledge that could help them establish a better future. If you would like to help them to get one more chance by donating one book or sharing this post, it means a lot to MBL. We can never achieve what we do without your help. 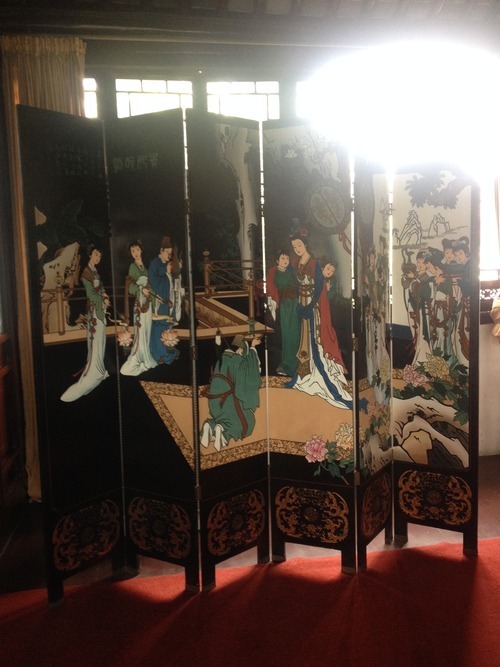 — POST the cheque to: MBL, 9 ORME COURT, LONDON, W2 4RL, U.K.
Suzhou, a city in South China famous for its beautiful classic gardens and handicrafts. 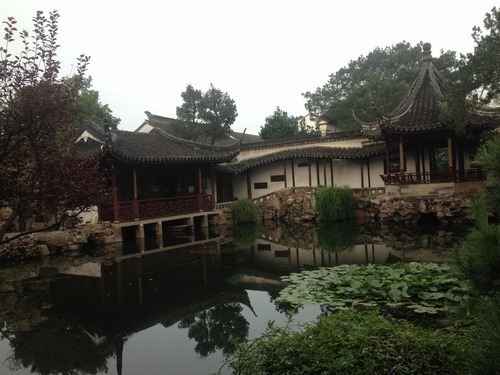 Two of our MBL volunteers have just started their one-year adventure in Suzhou, and they are recording their exciting life on a blog. Italian natives, London adoptees, travel lovers currently based in Suzhou, China. Sharing our experiences over a year living,loving and working in Suzhou ! Welcome to our blog! 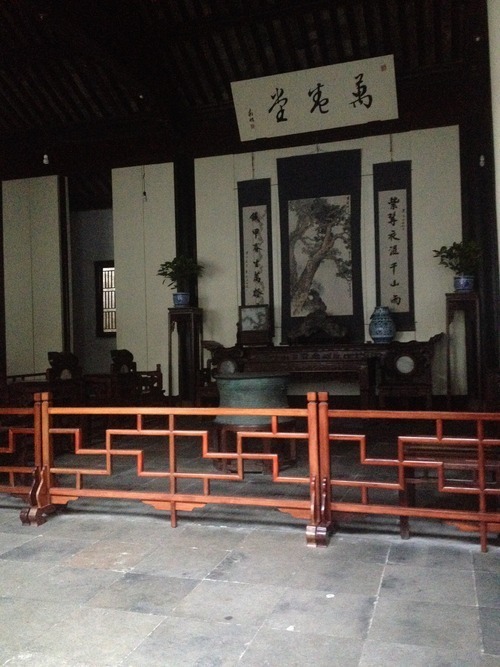 Here are some of their posts, for the latest update, visit their blog Home in Suzhou. Last week we assisted for the first time at the shooting of a documentary at the Master of Nets Garden 网师园 made by our company, Suzhou Media Culture Communication or 梅地亚. We were there by the very early morning and the absence of tourists and the quite of the place helped to create a magic atmosphere. The site is unbelievably scenic as you can see from the pictures below. MBL Academy: Suzhou is China’s well-known “city of gardens”, which tops all others in both the number (nearly 200) and the artistry of gardens. Gardening is one of the important types of architectural art, and the art of gardening has undergone a history of 1,500 years. These gardens have their own characteristics in layout, structure and style. The essence of garden is to construct beautiful surroundings by designing all the elements －mountain, water, path, indoor decoration, in a harmonious and organic way. Here is as it goes (in Suzhou): you walk on the street and get lost -it happens all the time because most of the street don’t have names or they only have Chinese characters, which you might try to deal with but will find yourself giving up very easily- and decide to approach someone showing them the address which you trying to find. So let the show begin: you choose someone- usually young because, naively, you assume they might speak a little English- and start walking towards that person who will immediately understand you’re trying to engage in a sort of communication. Their faces start to become worried because they know that you won’t give up that easily, which you don’t. So, after having finally stopped that misfortunate person, you try for at least 5 minutes to pronounce in a decent way those two words that you can remember…. So, if you’re thinking of asking people any sort of information be prepared because it might take a while but it will also be fun! MBL Academy: In China, the popularisation of English is still limited, especially in some small cities, which they have their deep-rooted culture and local dialect. You will find it is difficult to find English show in Street names or menu. Normally, international travellers cannot pronounce the Chinese street names correctly even they “knew”. Thus, the moment when international tourists are asking local people direction is always funny and time consuming, sometimes finally, you even cannot get a right direction by misunderstanding in communication. Chinese Mid-Autumn Festival, also known as Chinese Moon Festival, takes place on the 15th day of the eighth Chinese lunar month, when the moon is at its fullest and brightest version. This is one of the two most important occasions in the Chinese calendar (the other being the Spring Festival or the Chinese New Year) and it is an official holiday. This year we celebrated on September 8 and China public holidays lasted for three days. This is the time of the year for families to be together. The traditional food for mid-autumn festival is the moon cake which is round and symbolises reunion. Celebration of Mid-autumn festival has a long history since when the emperors had the tradition of worshiping the Sun in spring, and the Moon in autumn. MBL Academy: Mooncake (simplified Chinese: 月饼; traditional Chinese: 月餅; pinyin: yuè bĭng) is a Chinese bakery product traditionally eaten during the Mid-Autumn Festival (中秋节，Zhōng qiū jié). The festival is intricately linked to the legends of Chang E (嫦娥，cháng é), the mythical Moon Goddess of Immortality. Typical mooncakes are round pastries, measuring about 10 cm in diameter and 3–4 cm thick.